Up until now tempo has dealt purely with cards as they enter and leave play. A card which gives you +2 Energy is worth 2 tempo while it's in play Destroying a card which would provides an opponent +1 Energy causes them to lose 1 tempo. But how is tempo affected by adding cards to our deck, or losing them from it? When you gain a card you put it into your discard pile. If you gain it as part of a purge action then it is never in play: it goes straight from the board into your discard pile. It may appear that this has no effect on tempo at all. This is not the case! Remember, Progenitor is a deck-building card game. In essence, the basic point of the game is to add cards to your deck. Remember too that the concept of tempo is as a measurement of how well you are doing. In the abstract, gaining cards should be treated as the scoring action in Progenitor, as creating a deck is the goal of the game. Therefor, whenever you gain a card, you gain tempo. How much is gaining a card worth? Within the framework of the basic rules, what you need to do to gain a card is (a) have enough Energy to meet the card's Energy Requirement and (b) take a purge action. As each point of Energy is worth 1 tempo, and 1 turn (the purge) is worth 1 tempo, the amount of tempo you score when you gain a card is equal to the card's Energy Requirement plus one. Conversely, if you were to lose a card you would lose the same amount of tempo. Thus, card effects which allow you to steal cards from your opponents are extremely powerful, as when you take the card you gain the tempo while simultaneously causing your opponent to lose it; it's worth double the points! Let's look at an example: I play Heavy Duty Displacer (3ER, -1, played: Take a card at random from target opponent's hand), and manage to get a Mass Fabricator (3ER, +2, +2 Primes). ...so they don't steal something as nice as this. The Mass Fabricator costs 3ER, and so me taking it gives me 3+1 = 4. At the same time, my opponent loses the card and so loses 4 tempo. On top of that, you are taking it from their hand, meaning they suffer -1 draw, and Heavy Duty Displacer actually makes you take the card, not gain it - it goes straight into your hand, not onto your discard pile, and so effectively gives you +1 draw. After factoring in Heavy Duty Displacer's -1 Energy, and the standard -1 for playing a card (because you no have one less card in hand) this gives a total tempo swing of +8; pretty good! 8 tempo is a big play. How does that line up with other 3 Energy Requirement offensive cards? 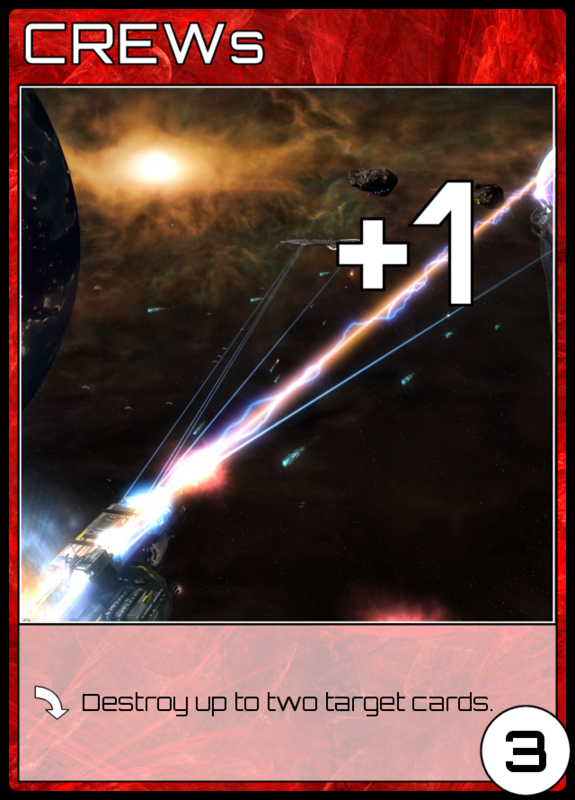 Well, here is Laser Salvo's big, big brother: CREWs (3ER, +1, played: destroy up to two target cards). My opponent has two Mass Fabricators in play. They are each providing +2 Energy and +2 Primes, so are worth 4 tempo while in play. If I play CREWs and destroy them both I'll cost him 8 tempo, while giving myself +1 Energy. Less 1 for the play makes that an 8 tempo swing! Swings of 8 tempo are much bigger than what we've looked at in previous examples. Indeed, if we look at the other 3ER card in question here, Mass Fabricator, we see it's only worth 4 tempo while in play. Why are the two offensive cards seemingly so powerful in comparison? There are two things to consider here. 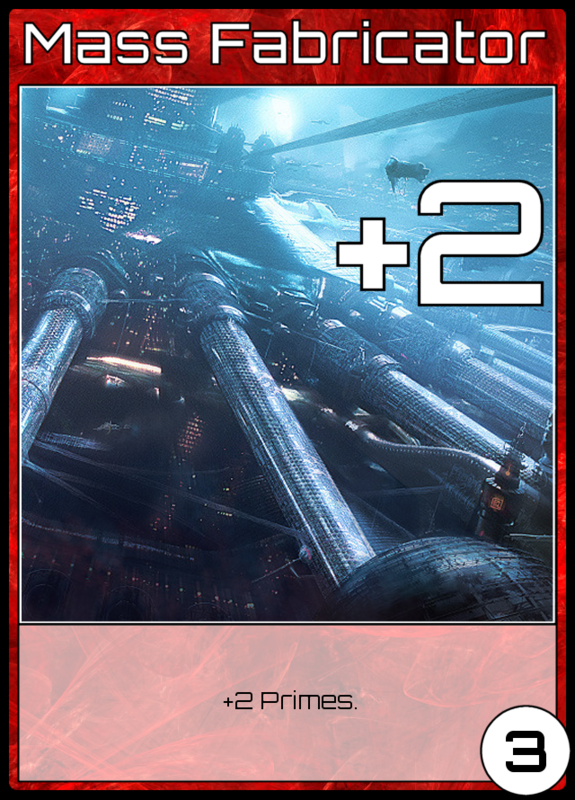 Firstly, the worth of the offensive cards is dictated purely by the target, and in these examples the Mass Fabricator is an extremely valuable one. 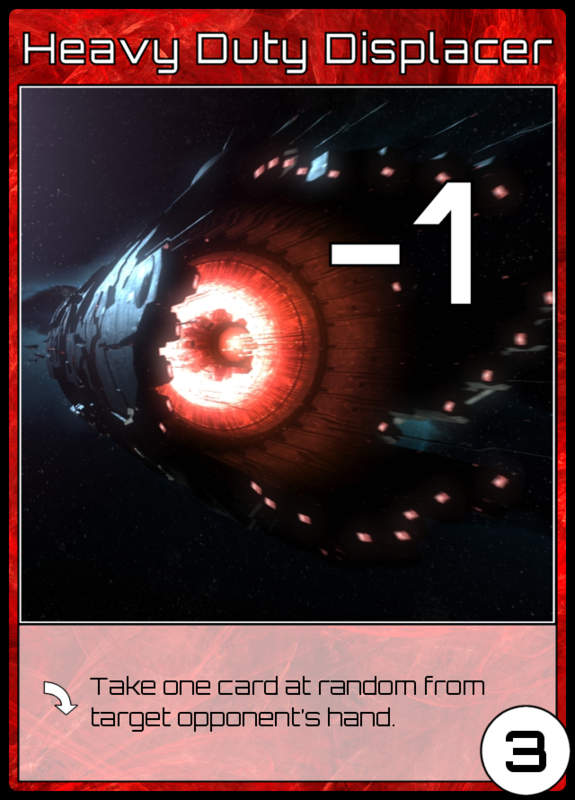 The Heavy Duty Displacer takes a card at random, and so could just as easily deliver you a 1ER or 2ER card (or even one with 0ER). The possible tempo swings for a Heavy Duty Displacer are 2/4/6/8 tempo for Energy Requirements of 0/1/2/3. Similarly, the value of the CREWs depends on what you destroy, with the 8 demonstrated here being fairly optimal. When you look at other 3ER cards the averages of these values are still comparatively high, however, and this brings us to "Secondly". Secondly, not to post a spoiler about an upcoming blog post, but offensive cards are less good in multiplayer games than they are in 1v1, and I'll explain why in the aforementioned future post.